Refurbished 2GB DDR2 SO-DIMM Notebook Memory 800MHz - Mixed Brands - 1 Year Warranty..
Corsair DDR3 2 GB SO DIMM 204 pin 1333 MHz / PC3 - CMSO2GX3M1A1333C9 Product Type: RAMmemory Capac..
Corsair Value Select 4GB DDR3 RAM SO-DIMM 204pin 1600 MHz (PC3-12800) CMSO4GX3M1A1600C11Corsair Valu..
TeamGroup Elite 4GB DDR3 SO-DIMM 240-pin RAM 1333MHz - TED3L4G1333C9-S01Product Type: RAM memoryCapa..
CORSAIR Value Select DDR3L 4GB 204pin 1.35V SO DIMM RAM - CMSO4GX3M1C1600C11Product Type: RAM memory.. Team Elite DDR3L 4GB RAM SO DIMM 204pin - TED3L4G1600C11-S01 Memory Type: DDR3L SDRAM - SO-DIMM 204..
Mixed Brands Refurbished 4GB DDR3L1.35v SO-DIMM 1600MHz1 Year Warranty ..
G.Skill Ripjaws DDR4 4GB 260-pin 2400MHz SO-DIMM RAM - F4-2400C16S-4GRSProduct Type: RAM memoryCapac..
Crucial DDR4 4GB SO DIMM 260 pin 2400 MHz - PC4 CT4G4SFS824AProduct DescriptionProduct Type: RAM mem.. Team Elite DDR4 4GB SO DIMM 260pin RAM - TED44G2133C15-S01 Product Type: RAM memoryCapacity: 4GBMem..
Corsair Mac Memory DDR3 4 GB SO DIMM 204 pin - CMSA4GX3M1A1333C9 Product Type: RAM memoryCapacity: .. Team Elite Memory DDR3L 8GB SO-DIMM 204pin 1600MHz (Low Voltage) For Notebooks - TED3L8G1600C11-S01P..
MICRON 4GB DDR3L 1866 MHz (PC3L-14900) SO-DIMM MT8KTF51264HZ-1G9P1Micron 4 GB, DDR3L, 204-pin. 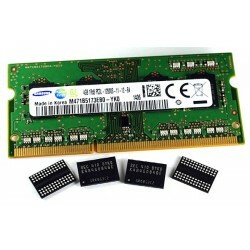 Inter..
CORSAIR Mac Memory | DDR3 8GB | 1333 MHz | 1.5 V | SO DIMM | 204pin | CMSA8GX3M1A1333C9Product Type:..